I love grocery shopping and I always like to take my time in the supermarket. Domestic goddess, I am certainly not, but at the supermarket you can always fake it. The domestic goddesses are the ones hanging out in the Fresh section, smelling fruits and vegetables. If it were up to me, I would be at the Instant aisle smelling instant noodle packets. But no, at the supermarket, we are all equal. No one knows how good or bad you are in the kitchen, so I like to take advantage of this clean slate. So umm yeah, I smell everything and pretend to give an approval nod before I put it in my trolley. When really, I am smelling for no purpose at all. Dean laughed at me, clearly knowing I’m enjoying every bit of this moment. The nerve. I’m only trying to choose what’s best for his stomach. You can’t rush these things. 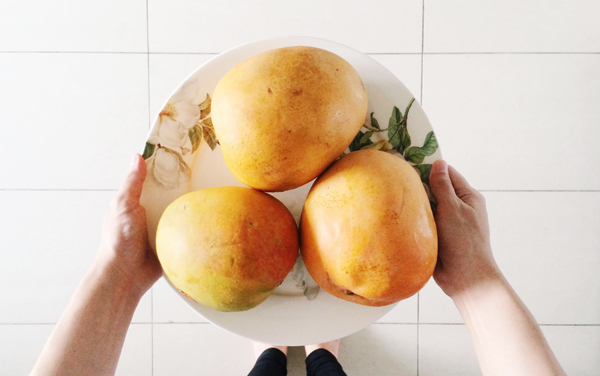 “Mmm yes,” as I picked up two other mangoes into the trolley. I really can’t explain it. the lady nampak ada getah mangga kt hidung you tak??? Why you so funny, Vivy. More pahala for you, in shaa Allah, for entertaining your readers with your jovial posts.